The Shark Video Slot Guide & Review - Casino Answers! The Shark is a 5-reel, 9-line video slot developed by Realtime Gaming, featuring scatter bonuses, a bonus game and a progressive jackpot. 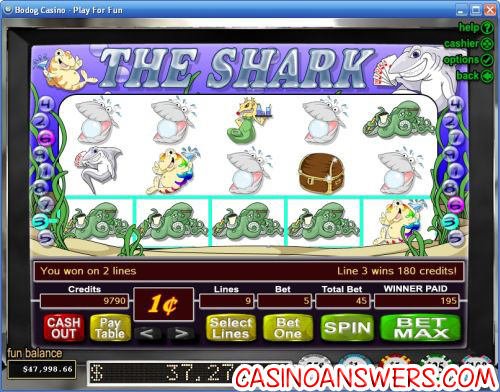 You can play The Shark video slot game at US-friendly casinos Winpalace Casino and Slotastic Casino. The Shark has a fixed coin value of $0.01. Select one of the casino chips in the denominations of $0.25, $1, $5, $25 and $100. You can cash out your casino chips at any time. You can then set the number of active paylines up to the maximum of 9 and also bet up to 5 coins per payline. The lowest bet you can make on The Shark slot machine is a penny per spin up to the maximum of $0.45 per spin. The Shark is a great video slot for low stakes players to play due to the low maximum bet. To play the maximum bet, hit the “Bet Max” button or hit “Spin” for all other bets. The Shark features a Shark Power Super Jackpot that you can win by hitting 5 Starfish symbols on an active payline. At this time, the Shark Power Super Progressive Jackpot is at $37,276.35. Try to win The Shark’s progressive jackpot now at Winpalace Casino! The Seahorse symbol (acting as a waitress) is the top fixed jackpot on The Shark video slot. 5 Seahorse symbols will pay out 1225 coins. The Jellyfish symbol is another high paying symbol, paying up to 900 coins. If you hit 3 Shark symbols anywhere on the reels of The Shark slot machine, you will trigger The Shark bonus round. The Shark bonus game is the exact same thing as the gamble feature found at many Microgaming slots such as Kathmandu as well as Playtech slots like Panther Moon. The dealer will have a card and you must guess whether the next card will be higher or lower. The bonus game will keep playing until you lose or you have won three times. Draws count as losses. You can win up to 2700 coins in the Shark bonus game. When you hit 3 Treasure Chest symbols anywhere on the reels of the Shark slot machine, you will win a scatter bonus relative to your total bet. You can win up to 495 coins with the Sunken Treasure scatter bonus. The Shark is an older video slot from RTG, but is still a lot of fun. It doesn’t have the greatest graphics or sound effects (not that they are bad), but what it still has is a good progressive jackpot, a basic bonus game and a low betting range that allows for casual slots players to make the maximum bet on. To play The Shark, sign up and make your deposit now at Winpalace Casino! Can players from the United States play The Shark for real money? Yes, American players are welcome to sign up, deposit and play all of the excellent slots and other casino games at many RTG online casinos, including both Winpalace Casino and Slotastic Casino. How do I win the progressive jackpot on The Shark slot game? To win the progressive jackpot on The Shark video slot, you must hit 5 Starfish symbols on an active payline. Make sure to play the maximum bet at all times to maximize your chances of winning that progressive jackpot! 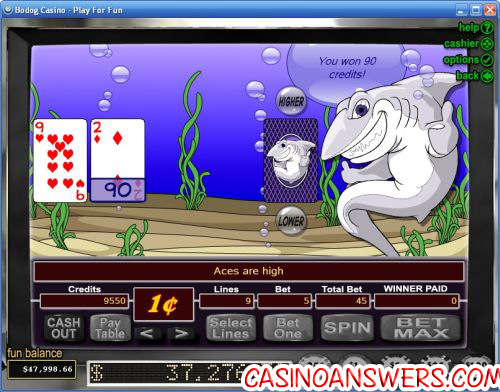 What casinos have The Shark flash game?